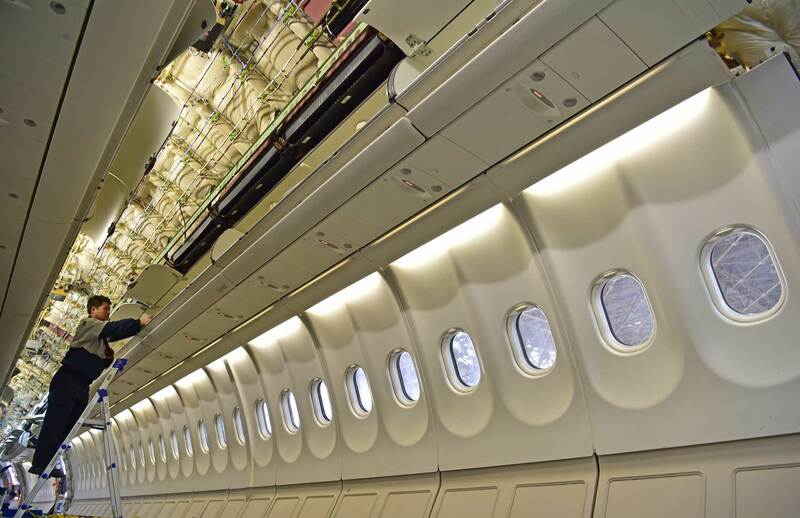 Ameco Beijing, the maintenance, repair and overhaul (MRO) powerhouse, introduced at ABACE 2018 its latest cabin interior design concept, “Chinese Dragon,” developed for the Boeing Business Jet (BBJ) version of the B787 Dreamliner. The unveiling highlights a new “strategic focus” on business aviation undertaken since the integration of all its MRO resources in 2015, according to the Beijing-based company, yielding design and completion capabilities Ameco (Booth H2212) is showcasing here in Shanghai. The Chinese Dragon concept is Ameco’s interpretation of the timeless mythical symbol expressed in a modern aircraft interior. The cabin’s nine functional areas incorporate geometric shapes, stripes, and gratings that represent abstract forms of dragon scales, spine, and even skeleton. Interior spaces include crew area, guest area, cinema, dining room, VIP lounge, bar, galley, master office, and master suite, containing a bedroom, bath, and dressing room. The color palette, drawn from traditional Chinese art, includes taupe, white, beige ivory with auxiliary turquoise green, and sky blue. Materials such white oak, marble, and metal are employed throughout the interior. The Chinese Dragon design has been shortlisted for the 2018 Crystal Cabin Award, the only international award honoring excellence in aircraft interior innovation. Though completions and refurbishments are receiving a new emphasis, Ameco has been providing maintenance and modifications for executive airliners since the 1990s, the first company in China to provide these services. Its capabilities cover all processes from designing, engineering, and certification to installation on airframes including the Airbus A330, Boeing 737/747, and new-generation Airbus Corporate Jets (ACJs) and BBJs. In fact, last year, Ameco was named an authorized BBJ completion center for the BBJ Max family, and an authorized BBJ Warranty Service Center, the only facility in Asia to hold both approvals. To meet rising demand, this year Ameco plans to build a new cabin interior manufacturing workshop, tripling its completion and refurbishment production capacity, and making its products and services “more competitive,” the company said. Its dedicated business jets completion and maintenance facility can accommodate a widebody aircraft or three narrowbody aircraft simultaneously. In addition to cabin work, Ameco provides heavy maintenance on BBJs and ACJs, and its 10 facilities across China facilitate services for business jet customers, according to the company. A CAAC Designated Modification Design Organization Representative, Ameco also holds Parts Manufacturer Approval (PMA) and SAI Global-issued AS/EN9100 certificate of registration.